Item #FO-286: 7"x1.75"x5.75" tall Fossilized Iridescent Ammonite (Madagascar). 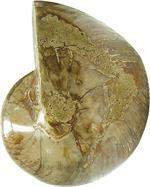 Item #AM-SPL-40: 3” Polished Split Ammonite Fossil from Tulear, Madagascar. Item #FO-351: Approx. 5"x3"x2.75" Gomphotherium molar Cuvieronius Sp. (South Carolina) of 1.40 lbs. Item #AM-IRR-AM-45: Iridescent ammonite (colignoceras) fossil (Madagascar). Item #FO-375: Approx. 5.5"x4.25"x1.5" iridescent Ammonite fossil (Canada). Item #AM-KFF-20: 12"x.75"x13" Knightia fossil fish plaque (Lincoln County, Wyoming). Item #FO-357: Approx. 3.5"x2"x2.25" Mammoth tooth of 1.05 lbs. 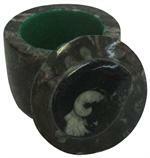 Item #AF-BX-M-25: 3 1/2" round medium Ammonite Fossil box (Morocco) with removable lid. Item #FO-271: Nautilus Shell Fossil. Item #FO-272: 4.75"x3.25"x4" tall, slight red iridescence Fossilized Whole Nautilus Shell (Madagascar) of 3.14 lbs. Item FO-282: 5.75"x4"x5" tall Fossilized Whole Nautilus Shell (Madagascar) with a slight red iridescence. 5.29 lbs. Item #FO-316: Average 10" long Orthoceras Fossil Dish from Morocco. 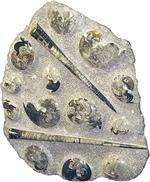 Item #FO-327: Average approximately 9.5"x7" Orthoceras Fossils in matrix. Item #FO-328: Average approximately 12"x7" Orthoceras Fossils in matrix. Item #AM-PAMM-15: 3"x1"x2.5" Polished Ammonite fossil (Morocco). Item #FO-325: Average approximately 6"x5.5" polished Ammonite fossil. 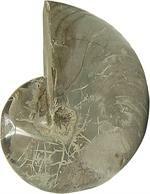 Item #FO-326: Average approximately 9"x8" polished Ammonite fossil. Item #FO-337: Average approx. 3"x3 1/2" polished Ammonite fossil. Item #AM-IR-AMM-25: 1.5"x1.5" polished iridescent Ammonite fossil. Item #FO-339: Average 3"x7" Polished Orthoceras fossil. Item #FO-331: Polished Orthoceras fossil in matrix ranging from 2" to 4 1/2" long. Item #AM-PY-D-38: 4"x6" Pyrolusite Dendrites (Solnhoffen, Germany). Item #FO-340: Approx. 8"x2.5"x2 Rhacolepis fossil fish (Santana Formation, Brazil). Item #FO-343: Approx. 2.75" Split Ammonite (Germany). Item #FO-120: Trilobite in Shale.